It’s been a few months since I returned to the United States after visiting Switzerland and I am still feeling a small pang of jealousy toward the Swiss people and their higher education system. I initially approached my visit with the intent of examining national stereotypes. We were asked to focus on accountability and keep in mind the question: “to whom is higher education accountable?”. I will attempt to tackle the intersections between stereotypes and accountability and how they affect global higher education. Let me first explain my jealousy and some of its implications. 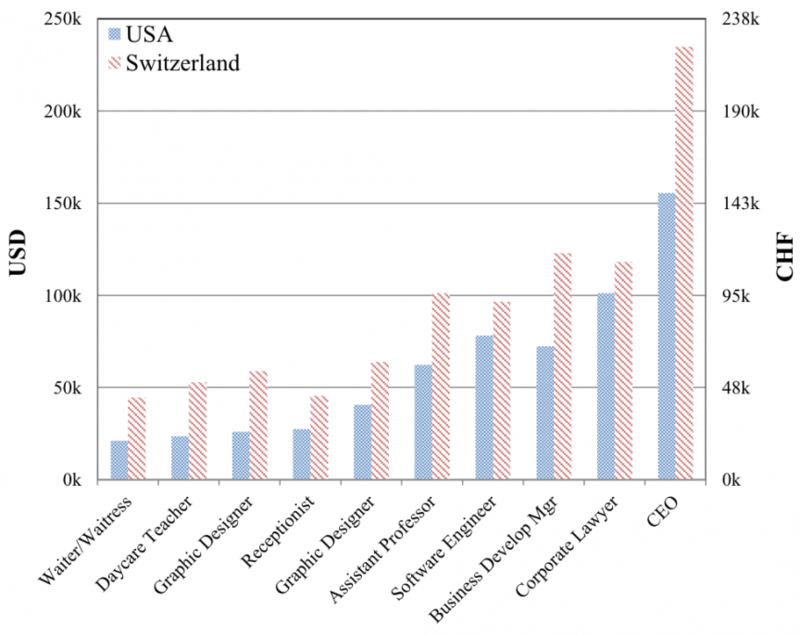 As I understand it, Swiss salaries do not have as great a disparity as American salaries. Prior to departure, we were given the example that a hairdresser could make a (roughly) similar salary as, say, a scientist. Talking with educators abroad, it seemed that this was true as well, and we were repeatedly told that someone who chose the Fachhochschule route via the vocational education and training system would in fact initially have a higher salary than someone who chose the gymnasium route to the university. Loosely in American terms, someone who chose a trade/vocational job would initially have a higher salary than someone who chose to go to college/university, and that ultimately salaries didn’t differ much. 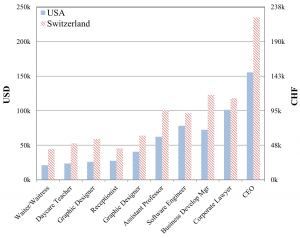 A quick search for some jobs and their average salary for Switzerland and the USA for the ten jobs showed that a Swiss salary exceeded the USA salary by a minimum of 16%. Bloomberg Business ranked Geneva, Zurich, Bern, and Basel, the 9th-12th most expensive cities in the world in 2010. (Comparatively, New York City was ranked 29th.) Generally, it is much more expensive to live in Switzerland than in the USA, and this can be one of the factors of the overall higher salaries. So maybe this isn’t as disparate as I imagined. Figure 1. Average salaries by job title. Why am I still jealous after I can rationalize the difference in salaries based on the cost of living? I believe my visceral response to the Swiss concept that someone can be considered successful without worrying about their ultimate job is the root of this jealousy. It comes down to alleviating some of the stress associated with choosing a particular career path. Perhaps it is that a “starving artist” does not seem to exist in Switzerland. I was informed that while there may not exist a Swiss “starving artist” the way Americans are accustomed, that income poverty remains an issue to the country. The United States Census Bureau reported a 14.8% poverty rate in 2014, encompasses some 46.7 million Americans. Comparatively, the 2012 poverty rate in Switzerland was 7.7%, a number that includes almost 600,000 Swiss. It would be of course remiss to neglect the annual income thresholds each country uses to define ‘poverty’. Consider a single adult under age 65 in each country; the US threshold is just above $12000 (CHF 11500) while the Swiss threshold is CHF 26400 ($27500). Perhaps it is the idea that a Swiss person can succeed with his/her individual abilities despite overall differences among abilities in general, whereas an American person can succeed more or less with his/her individual abilities because of overall differences among abilities in general. Underlying these are the education systems of each country that colors the biases, stereotypes, and truths that promote these concepts. Let us take a look at a few basic statistics about Switzerland and the USA. Switzerland has a long history, nearly 500 years the USA’s senior. The USA is nearly 240 times larger and approximately 40 times more populous as Switzerland. The 2014 Elcano Global Presence Index (GPI) which is based on a country’s economic, military, and soft presence within the global community places the United States in 1st and Switzerland in 20th position overall. Education is a factor in the softs presence category, and is defined as the “number of foreign students in tertiary education on national territory”. Similar to the overall positions, the USA and Switzerland ranked 1st and 21st in the education category, respectively, in 2013. One could interpret this by stating that a global approach to education is more important to the American that to the Swiss. 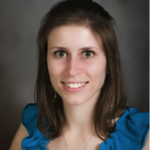 This can possibly be seen even in the selection process among the 2015 GPP cohort from students at Virginia Tech and Universität Basel. We were told that due to the high interest in the program, many students at Virginia Tech were turned down from this year’s trip. It seemed that this was not the case for students at Universität Basel, where fewer students applied for the elective trip. This “pioneering” spirit may be due to the fact that American students are more likely to travel further from home to attend university, while Swiss students primarily commute from home. The ability to “study abroad” has been touted by American universities as a rite of passage, and in some cases, an expectation, for many American students. American universities tout the existence of their respective study abroad programs when recruiting potential students. Keeping these dissimilarities in mind, I’ll comment on some of my other observations and thoughts about how we can affect global higher education. Generation Y (also referred to as “Millennials” or “Digital Natives”) have posed a new challenge to existing higher education systems. We were met at Universität Basel with a snapshot of Generation Y; pragmatic, uncertain students who are facing inordinate possibilities. The burden of decision was deemed one of the most defining (and somewhat crippling) characteristics of current students. One of my favorite quotes was in reference to exposing young people to the many possibilities of the world, and went along the lines of, “should we support this way of thinking? Or should we let them (young people) swim in the cold water?” Since I heard this analogy, I’ve been thinking a lot about responsibility and accountability, and how our perceptions on life affects our expectations for these. One major difference I observed between my life-long experiences in the United States and my brief travels abroad were the national attitudes and practices toward diversity and inclusion. Recently, there has been a large push in the United States to increase diversity among the general workforce, which has also brought this to the forefront of higher education. There has been a heightened sensitivity toward people as individuals, and a trend to embrace the positive effects diversity has on the whole population. When asked about the availability of disability services in Switzerland, we were repeatedly told that there really was not an extensive availability of services that an American might consider “standard” on a college/university campus. My impression of the Swiss attitude was that it was up to the individual to take responsibility and accountability for their diversity; i.e., if a student had a physical altercation with another student, the matter was to be taken up with police. Notably, there were two “identities” I observed being approached differently – physical disability and race. The former identity was more prevalent in my travels than at home. Even walking down the street, I saw more Swiss people with crutches (a single crutch, really) than I have in my average walk in the United States. Perhaps the Swiss health care system inherently causes a wider acceptance of physical assistive devices in Switzerland than in the United States. That being said, I saw few measures taken to accommodate students with disabilities. While one classroom at Universität Basel reserved seats for students who were hard of hearing or physically impaired (as noted by a physical paper on the closest seats in an auditorium-style lecture room), this was not widely observed. I noticed that many of the classrooms seemed to remain unchanged for tens of years, save the addition of electrical sockets and lights. The auditorium-style room created a space which echoed greatly and made even a clear speaker’s words confusing for someone who is not impaired. Based on my experiences in the United States, there are still large lecture rooms that resemble this, but I’ve seen a more widely accepted “modernization” of classrooms with updates that range from basic ease of physical accessibility to some of the most modern technology-enhanced classrooms. I suppose part of this issue is the rich history of European universities as compared to their relatively young American counterparts, where a newer university may embrace physical changes over preserving historical architecture. The latter identity is more prevalent at home than in my travels. Obviously, the racial tensions begot of the United States due to its history have left Americans with a somewhat unique situation that is not present in Switzerland. Race has been on the forefront of recent American headlines, from defining ethnicity and nationality to discussing affirmative action to defending symbols and statues and debating immigration. It seems that Americans are challenged with “righting” wrongs of the past, and are increasingly sensitive to how we discuss the topic entirely. Despite hearing that the Swiss were proud and protective of their heritage and culture, I did not feel ostracized as a foreigner. The well-defined Swiss higher education system, with its two main tracks (general vs. vocational education) for students, provides Swiss children and young adults with an upfront map to their career choices. This map seems to have well-defined actions one should take to progress to the end goal. Obviously, there is little need for career services at the university level when the basic plan for career paths are so well-defined and widely adopted early on in one’s career. I imagine fewer Swiss students progress through their education with trepidation for their future careers as compared to American students. American students are told from an early age that they can be what they want to be and that “no child will be left behind”. I imagine (and observed in some of my fellow Swiss cohort members) the Swiss people are shocked or off-put by the apparent “hand-holding” that is so common in the United States. Our education system has been structured around endless possibilities – and talk of the many possibilities is overwhelmingly positive. Honestly, prior to really thinking about the implication of inordinate opportunities and possibilities, I failed to see the potential negative effects this mentality could have. However, I realized that the American reliance on career services at the college/university level probably stems from this. I would be willing to bet that career service centers started becoming standard at American colleges and universities around the time the earliest Millennials started attending. Table 1. Some of my observations of higher education in the United States and Switzerland. So what do these stereotypes have to do with global higher education and accountability? It is clear that the Swiss higher education makes students responsible and accountable for education. Conversely, the American higher education system shifts part of the responsibility and accountability to the university. How can we blend the positive measures taken both by American and Swiss universities for future students? I believe the Swiss system can serve as a model for higher education in the United States. Implementing the Swiss philosophy, the United States could adopt clearer pathways for careers, and better define exactly which degrees and levels of degrees are required for these careers. That is to say, students pursuing trade professions may not necessarily benefit from formalized higher education to the same extent that students pursuing “white collar” professions. Placing less value on a degree for certain careers could help students find ways to achieve success without following traditional higher education paths. This would require restructuring the higher education as well as the economic/labor systems in the United States. The change inherently involves more than bodies that govern higher education. However, I believe this transparency in the system would be beneficial for everyone. I believe the Swiss higher education system could model a few of the more basic services typically provided to American students at universities and colleges in the United States. While there is merit in self-accountability, knowing that there are resources and regulations for things such as campus safety could alleviate the stress of self-reporting potential sexual and criminal offenses that occur on campus property. Ultimately, stereotypes are founded on some truths. Regarding the Swiss and American higher education systems, these stereotypes can be attributed to some of the disparate facts about their respective histories. Obviously, Swiss and American national stereotypes (founded or not) affect global the respective higher education systems, and in some cases, in contrasting ways. These stereotypes affect our national perception (and action) on accountability related to higher education, and can be observed in the drastic differences in student services provided (or not provided) by universities. While these services can be beneficial (e.g., ensuring safety on campuses), we should be cognizant that providing too many services, in some instances, may cause students to become less accountable to their own education and careers, and more reliant on others to make difficult decisions. Modeling global higher education at individual universities can allow national differences to propagate and affect the cohesion between students attending universities at various locations. As we progress in designing courseware and systems of education, it is critical that we be aware of our own stereotypes and those of others in order to foster a consistent, connected global community of education.